Yes, wellies. In July. We've had two week's worth of rain here in two days. It was weirdly hot today though, and I was way too warm in a cardigan and my trench coat. I really enjoying splashing in the puddles during the walk home though, but wellies are hard to walk in!! Also, because of the rain, I was forced to take inside pictures today. The knack to taking inside pictures is not yet something I have learnt. I walked around the house for ages before having a go outside. I took a few pictures (which I hated) but then it started to drizzle and I worried about my camera getting wet. Then I remembered having used this wall before and thought "ahh, great." However, it is in the conservatory so some of the pictures are a little bright!! I had a lovely day today. I was knackered this morning and got up much earlier than I would have liked, looked out of the window and thought, urgh. I had plans to meet my friend Eve for coffee, but the more the rain poured, the more I wanted to stay inside and read. I wasn't in the best mood thing morning and I just felt very lethargic. Then, I had a good work out and thought, you know what? it would be really nice to go out and see someone. We ended up having coffee and a lovely catch-up for 2 and a half hours. It really made me glad to be home. I think I get so caught up in what I miss in the States, I forget all the people and the things I missed back home. I've made plans to see lots of people and keep busy this week and I'm excited. I should probably touch on the reason I wasn't in a good mood this morning because I guess it relates to you guys too. It's not like you guys haven't noticed that I haven't been in the best mood since I've been back from the States. I've been down. I've been moody. I've been sad. I haven't been the most cheerful blogger, or person, in the world. This morning, my boyfriend mentioned that I've been this way and wanted to know what he could do to make me feel better. He was upset that I always seemed to be sad. I admit, it's been hard. Leaving the country, the people and the boy I love behind has been very hard. I miss my life there. But as Erick pointed out, I do have to accept the situation, as difficult as it is. And he's right. I'm really sorry for being so moody and sad the last few weeks. It's just been very difficult for me to accept that my year abroad is over and settle back here in the UK. But there is nothing I can do about it and I have to just accept it and make the most of the situation. See my friends. Enjoy the things I miss. Make the most of the time I get to speak to my boyfriend. Seize the opportunities that I have. Thank you for all your continued support. I'm really going to try to focus on the future and the good, not on the things I miss. Now, outfit time. I really, really didn't want to get dressed today. Not into anything nice anyway. But I'm only onto Day 19 of 30 for 30, so I have to take every day I have to wear something new!! 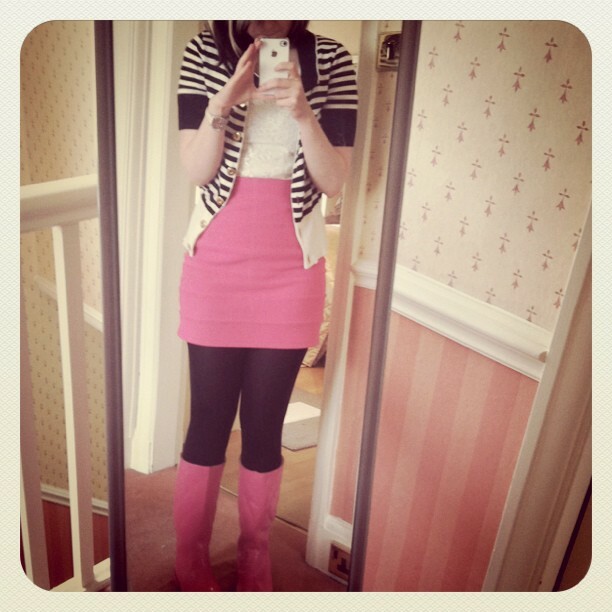 I wanted to wear pink today to match my pink wellies, and I love the look of stripes and pink, so the outfit just fell together. The leopard belt was a last minute idea, but I really like the additional print. I actually really like this outfit. Yay for 30 for 30 inspiration!! I'll back back tomorrow!! Have a lovely day!! I would look like a complete goon! This skirt is so pretty, love the pink and strip combination! And the leopard print belt is perfect with it. I'm sorry you have been moody and down. I hope that all goes well and improves though. You look lovely as can be in these shots.